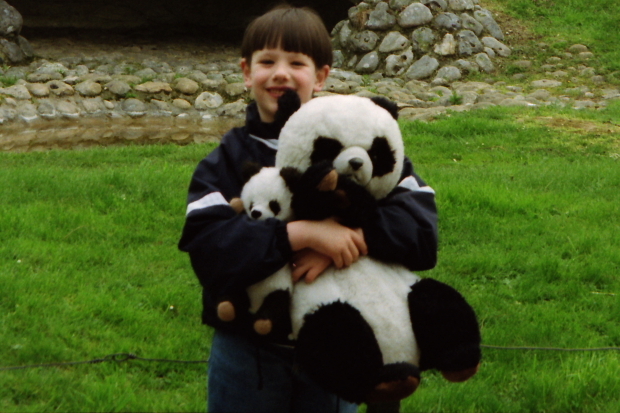 Here is the story of the first panda who lived in France: Happy. Happy (male) was born approximately in September 1935. He has studbook number 5. He was captured by Floyd Tangier Smith in the Chinese Sichuan Province. Together with 5 other pandas, he was shipped from Shanghai to the United Kingdom. They arrived in London on December 24, 1938. One panda died from internal lesions on the transport, one died in the quarantine station of London Zoo and three were sold to London Zoo. Happy was for sale at a price of 10000 dollars. But for the reason of the tense political situation in 1939, none of the European zoos neither had the courage nor the money to buy this panda. Otto Fockelmann received Happy from his owner, Floyd Tangier Smith, in trust on January 26, 1939. He took him to Hannover and placed him at the disposal of animal dealer L. Ruhe for exhibition in Germany. Ruhe & Fockelmann displayed him at Zoologischer Garten Berlin, Zoo Hannover, Münchner Tierpark Hellabrunn, Zoologischer Garten Leipzig & Kölner Zoo. After his German Tour, Happy was on display at the Zoo de Vincennes in Paris, France from May 24, 1939 until June 6, 1939. Happy was sold to the Saint Louis Zoo, Saint Louis, USA. Happy arrived in Saint Louis on June 24, 1939 and stayed there until his death on March 10, 1946.